Even before my commitment to become a Tenkara angler, I learned you didn't need much in small stream fishing. I've been writing about it all along. I have even tried casting a fly line with my hand, yes, it does work but no, not better than a rod. I have a friend who is an author/fly angler and when I offered to introduce him to Tenkara, he says when he wants to go fishing in a "minimalist" style, he leaves his rod at home and puts his reel in his pocket and casts the line with his arm. But I could not have said it better than Daniel, all you need is a rod line and fly which I think is a little decadent. But if you think about it, Tenkara is too in the face of Western fly fishing. I'll describe my Tenkara equipment, what I use to fish, it may help some of you or it may seem foolish. I've asked a few people that I know to detail their "minimalist Tenkara" kit as well. They knew exactly what I was asking for. To the left of my rod (Tenkara USA Ito) is my every day carry for fishing and to the right of the rod is my travel (back up) kit. It has everything as my EDC but is condensed. I carry this with me in my daypack and anytime I go anywhere. My choices have changed very little in the last seven years because I learned quite a bit about a minimal kit before I understood Tenkara. In building an efficient kit, I've come to the conclusion that this knowledge base has allowed me to carry very little. Entomology becomes less important which allows me to carry far fewer flys which in turn keeps my choices simple in preparation and on the stream. Accurate casting and presentation skill. That probably has been my motto, which officially also happens to be "to inspire anglers to leave the unnecessary behind". 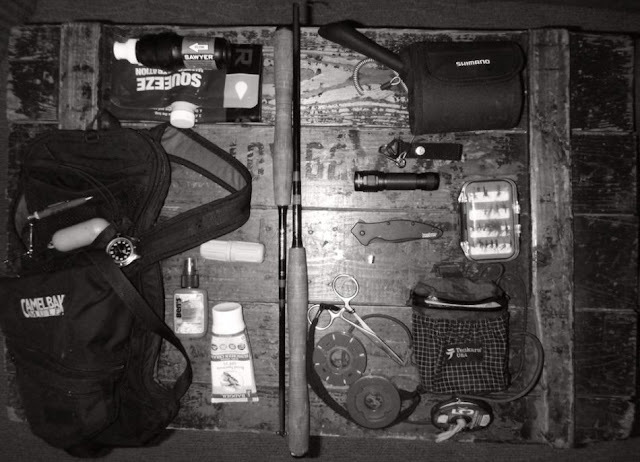 This is rooted in my pragmatic belief that if I have fewer things in my kit, then I have fewer chances of second guessing myself, fewer things to lose, fewer things to forget and will hopefully spend less time dealing with gear and more time fishing. That quote is from Daniel's contribution below. His words cut straight to the chase. The other anglers have said similar things in the same direction. I have found in Tenkara, there is a common theme, efficiency. It is enjoyable to be able to quickly grab your gear and go, knowing you have everything you need in a small kit. Each component is important to the next. If you forget your line, well, there is no fishing so as the kit becomes more efficient, the parts of it also become more necessary. I have wanted to put this type of article together for quite some time but I struggled to find the words to begin. I started out with the topic of “Minimalist Tenkara” and researched it a little at our forum and meet a little resistance but I knew that is what I wanted to write about. I looked into why minimalist described why they enjoyed fishing that way and I saw the common theme. I understood it from my own experience and came up with a few ideas that had been circling around in my thoughts and placed them here. My perspective on learning Tenkara is from fly fishing mountain streams. I am 55 years old as I write this, living in the Southwest of America. 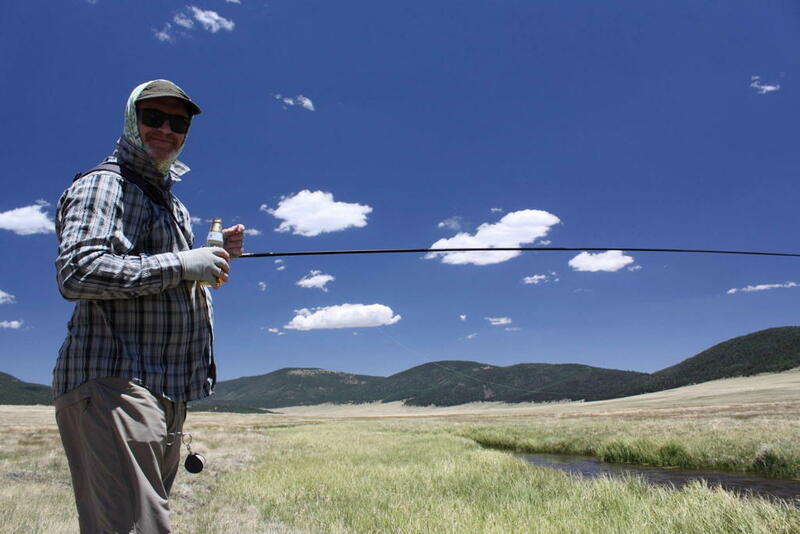 As a young boy of ten years old in 1971, I was taught fly fishing by a friends father in the mountain streams of Utah. Up until that time, I had been fishing with a long cane pole and was given a bait casting rod that I had used with some success. 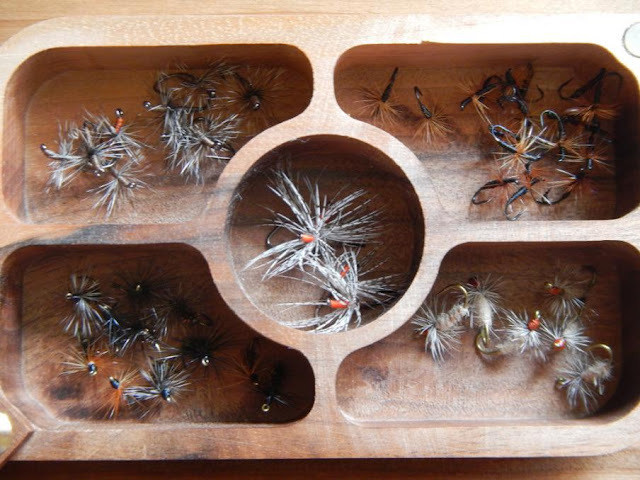 My fly fishing lesson was brief, the rod I was given was 8 or so feet long, I was given a few flys to use that looked like colorful soft hackle flys that you would find in a cheap convenience store circle divided box and a leader as long as the rod. My lesson was brief, “grab the line in your grip and cast a little bit of the line like this” and with that, I went fishing and actually caught the trout in the small streams. My family moved away and I lost touch with my fly fishing friend. That was my first exposure to fly fishing small streams. It’s interesting, my first lesson in fly fishing was repeated to me 25 years later by a talented young man that also didn’t carry a whole lot of equipment. He explained to me that it just wasn’t necessary, small stream trout are opportunistic and the placement of the fly was more important than the fly itself. 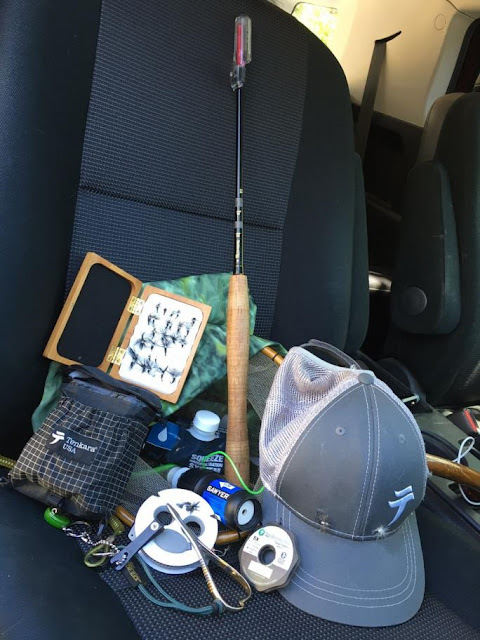 The way you approached the stream was more important than the equipment but all the aspects of fishing together, the sum of it all was more than the parts added together. I distinctly remember at that time, a common theme in fishing small streams, to be good, you did not need much. 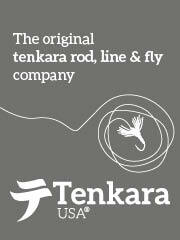 In 2009 I received my first Tenkara rod from Tenkara USA. I choose an Ebisu and bought a tapered line to go with it. It was ok but I really liked the light fly rods that I was using at the time and my 0-weight fly line was just about the size of the tapered line. I purchased a length of 00-weight line and fashioned a line just about as long as the rod and began my Tenkara fishing using the same kit that I was fly fishing with, a small 6 compartment fly box and a spool of tippet with a nipper and needle driver. As with anything that I do, I began to research Tenkara and I shared my interest in it by making this web site on our subject, writing about what I found, exchanging information with others all over the globe and finding out more about the history, the experts in Tenkara and I also began to go to Japan to meet and fish the area where it came from. Which brings me to this article, the minimalist choices in fishing small streams is a common theme for people who are successful and experienced at it. Minimalist simply means efficient, more is not necessary and if anything, more equipment can be a distraction. Let[s go back a little farther and understand the history of Tenkara and how it pertains to our subject. I first heard it from Daniel Galhardo in a conversation that we had. He told me that he first heard it from Yoshida Takashi. We were discussing Tenkara and Yoshida-san told Daniel about the “generations of Tenkara” and briefly it was the first generation which is Yamamoto Soseki, the father of modern Tenkara. The second generation is Ishigaki-sensei and his teaching of Tenkara and the third and last wave is Yoshida-san’s school of Tenkara. Daniel and I were discussing our perspectives, comparing and contrasting and I think that idea of generations or waves of Tenkara is a great way to look at the history. I would describe the generations or waves a little more in detail with Bunpei Sonehara being the first or generating wave, his work as a professional Tenkara fisherman bringing char to market using what is now known as Tenkara back in the late 40’s. This early Tenkara is described in the book about his life. Soseki-san wrote books on Tenkara and included many of his peers and their look at Tenkara. He included Yuzo Sebata in much of his writings as well as Ishigaki. They would be the second wave. Sebata-san came to America in 1992 and made a video of Tenkara in our famous Western rivers. The third wave, yes, Yoshida-san and his school of Tenkara in Japan but from my perspective it would be Daniel and his introduction of Tenkara essentially to the world using the Internet as the medium. Daniel is too humble to include himself in this timeline but without question, I would say that he is also a part of this third generation or wave of interest in Tenkara. What does all of this have to do with “Minimalist Tenkara” and my view of it? It has to do with efficiency and the dissemination of information. When we fish Tenkara, ultimately it is our skill that catches fish. That skill is learned by experience and lies within yourself. Our knowledge base grows with experience and that experience is created or made with skill. Our equipment is honed by that skill. 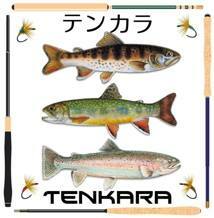 Through the years, Tenkara, the method has a common theme and that theme is skill and efficiency born of professional angling. Catching as many fish as possible efficiently. That efficiency was created long ago and the efficiency remains today. Tenkara, not the skill of adapting Western fly fishing with a reel to Tenkara techniques, Tenkara as the method. The minimalism in Tenkara is not so much a choice as it is a reflection, the method of the skill in the angler. And last but not least, my "one fly" as it stands now. 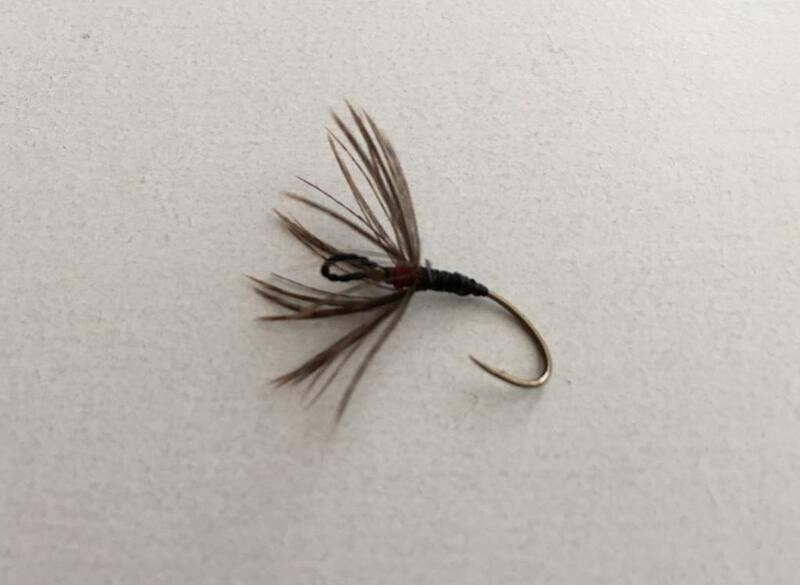 A keiryu bait fishing hook with bead cord eye, red thread head, India Hen hackle and black thread body. Below are a few Tenkara anglers that are so kind as to help me understand what it is to be a minimalist Tenkara angler. I fish in a minimalist style, not because I want to, but because I fell into it naturally. I like gear, and used to carry a lot, but now just carry what I need to be comfortable for a day on the stream. 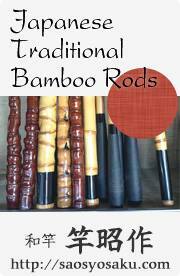 I normally bring one rod, but will bring two if the river is new to me, a longer one and shorter one. I bring a small water bottle, water filter and bags and some snacks. I may have a line spool, nippers, and forceps for tools. A spool of tippet, a damo, my rod and line for tackle. I use my hat for my fly box and carry my tools around my neck on a lanyard. I will have a poncho for rain and buff for sun and wind. I keep my food and water filter in a cuben fiber stuff sack and everything else in my day pack. The simple angler carries nothing but the necessary. That probably has been my motto, which officially also happens to be "to inspire anglers to leave the unnecessary behind". 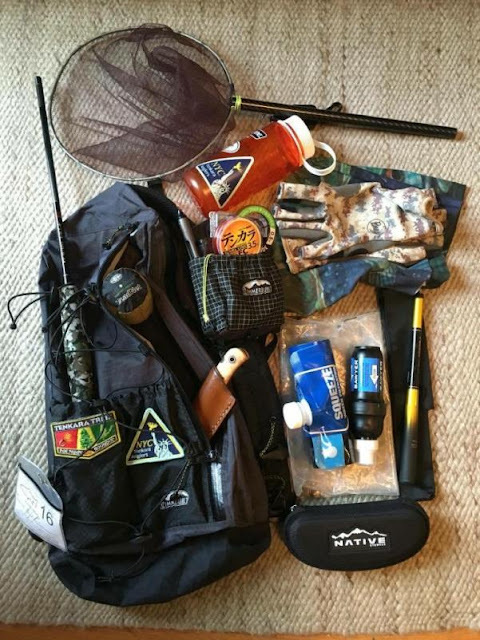 This is rooted in my pragmatic belief that if I have fewer things in my kit, then I have fewer chances of second guessing myself, fewer things to lose, fewer things to forget and will hopefully spend less time dealing with gear and more time fishing. 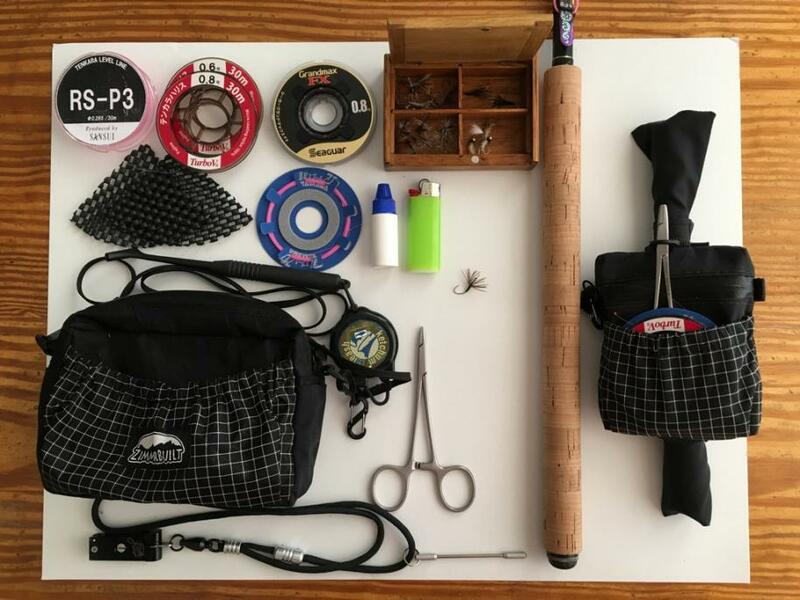 For close to six years now this is what I have carried with me on fishing trips in four continents and thru more states than I can count in my fingers. It consists of a small pouch where everything goes, my fly box with a few variations of one fly pattern, tippet, nippers and forceps plus a fishing license. That's it, no more, no less for fishing. When leaving home, whether for a couple of hours of fishing nearby or for a month abroad, I pick the kit, a rod and go. I don't forget anything, I don't have to spend time thinking about what I should pack for fishing, and I do catch fish. 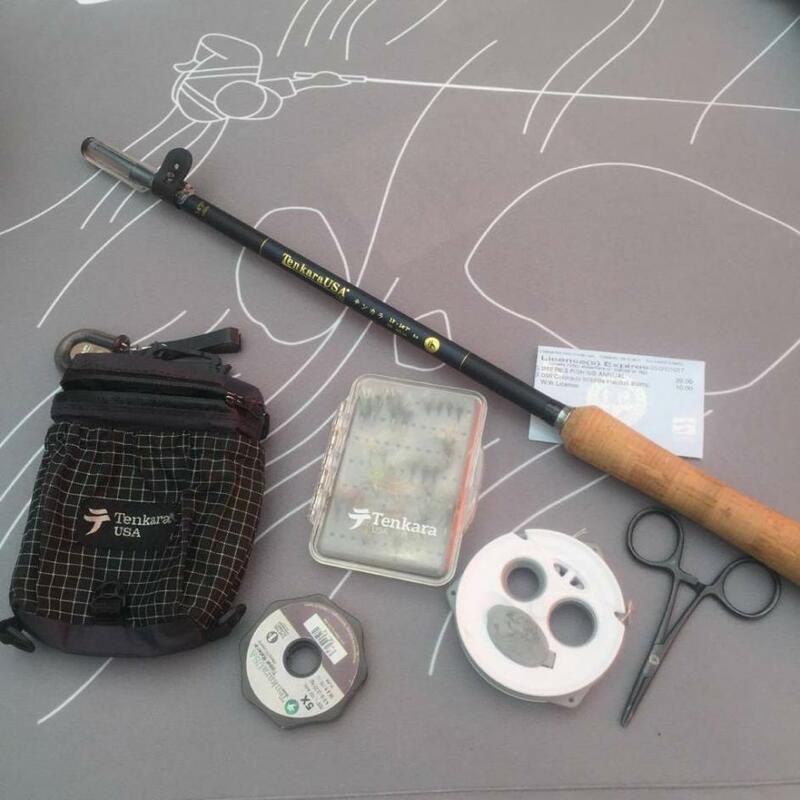 "These are my tenkara fishing tackle when I am on a genryu fishing camp. 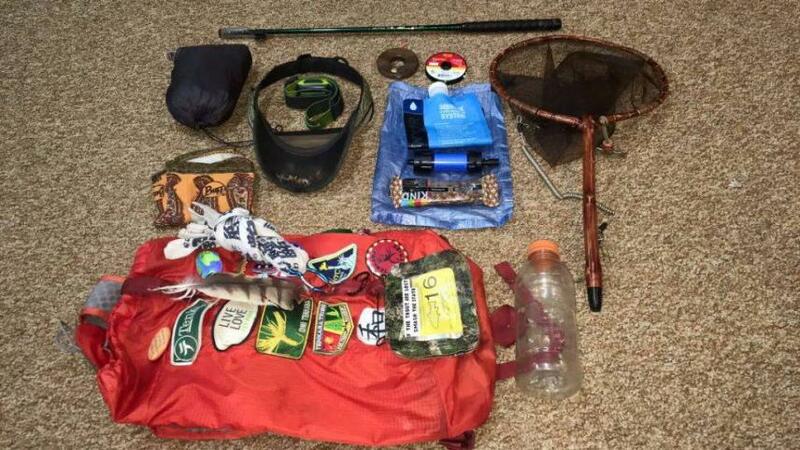 As we have to carry every camping gear, foods and fishing tackle in a backpack, we take the minimum necessary things." The musings of a fellow tenkara lad…. One of my favorite cookies takes only 3 ingredients. Form 12 balls from this dough and bake at 350 degrees for about 10 to 13 minutes and you have a sweet treat that will knock your socks off. One has to appreciate the art in the simple... Simple, Sweet, and Effective. My Tenkara Fly Fishing is the same and only takes 3 ingredients. Rod, Line, and Kebari. This is what drew me to tenkara in late 2009 and I have been smitten ever since. I even work for Tenkara USA and help thousands of folks get into tenkara every year. Life is good! As for my Kit that I carry, that is equally as simple. Here is my recipe. Bake the above with a shot of Sake or my favorite whiskey and I am on my way to a sweet adventure. Since I have been fishing tenkara I have become a convinced minimalist fishing gear enthusiast because my tenkara game is all about improving my skills to be able to go fishing anywhere and to be able to rely on my technique rather than gear. My go to tenkara fishing kit is very basic, ultra light and contains only what I need to fish. 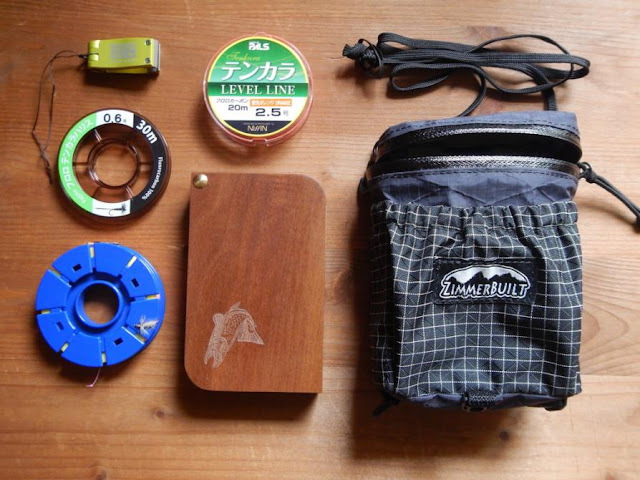 A strap pouch with a box that contains kebari, a spool of level line, a spool of tippet, an empty line spool and a nipper. The only accessories is a pair of stuck sections pads. 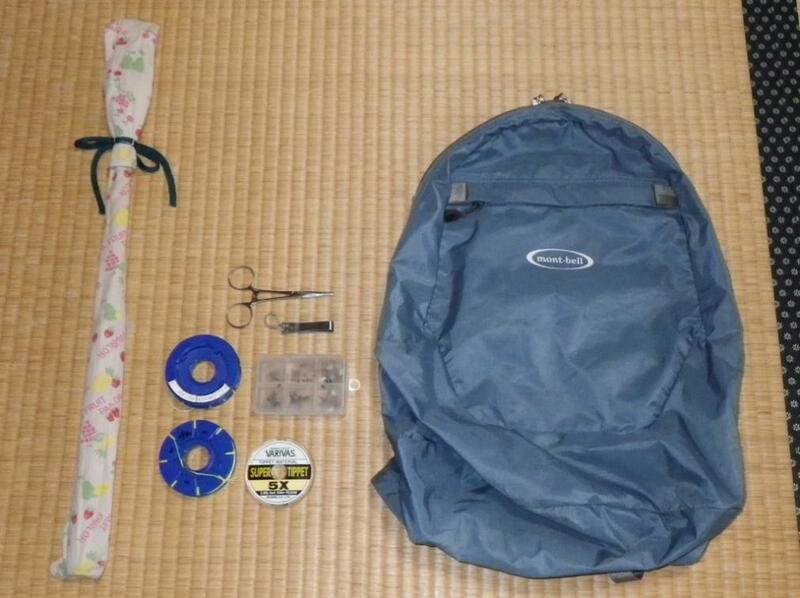 I own a lot of gear that I rarely use like the Ishigaki’s Shimano mesh vest, several Inazu and Mankyu keiryu tamos. I like these pieces of gear as they are very high quality but I do not really feel like needing them. We often hear that tenkara is simple and effective but what most seem not to realize is that tenkara, as a sport fishing technique, is effective because it is simple. With time my approach to tenkara has become more minimalist as I think that only a minimalist approach of gear and tackle can lead to constant technical skills improvement. It is surely not by chance that the most famous Japanese tenkara sensei such as Ishigaki, Sakakibara or Sebata use very few fishing gear and are able to out fish any of us on any stream. They have understood, experienced and still demonstrate that technical skills is the key to successful fishing. Traditional tenkara was a job, it was commercial fishing and it is understandable that these anglers had to catch fish at any cost; modern tenkara is a sport and is all about technique. If I wanted to catch trout at any cost I would not be a tenkara angler, I would practice other fishing techniques such as bait fishing. My perspective of tenkara is fishing with my own technique, my own rules. 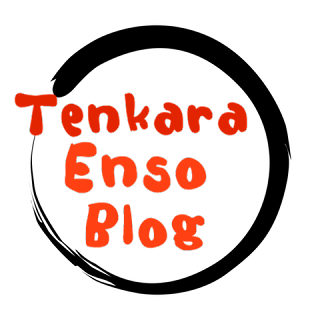 I recently had an interesting conversation with a friend of mine and when he asked me how I would name my tenkara perspective I spontaneously answered: « tenkara kansei » which can be translated by « tenkara accomplishment ». To me it will be a mix of the best skills I can develop and the unspoiled pleasure of fishing with minimalist gear and tackle. When I go out for the day fishing, I’m often going to be hiking to my favorite spots at least a little bit, and won’t be able to go back to the car for anything during the day. I choose to use a Zimmerbuilt Guide Sling with a Zimmerbuilt Strap Pack on the shoulder because it can hold my basic Tenkara tackle along with an extra layer, lunch/snacks and a few other items that I find useful for an entire day out in the woods and on the water. The things I carry are just the basics that I need to stay warm, hydrated and prepared for what I might encounter in the Northeast USA. I prefer to use level line, and I’m totally open to fishing with dry flies, soft hackles, and beads as conditions require - although these days I’m fishing more soft hackles than ever before. Something about the Oni rods just makes them come alive in new ways for me. Doesn't everyone feel bad that their other rods are getting lonely just sitting at home. I think they all deserve to feel the tug. An old Camelback M.U.L.E. left over from my mountian biking days fits my backpack duties. I have other packs that carry more, but this one makes me commit to going light and I am accustom to how it feels after 20 years of use. Attached to it are a watch, a Ty-rite, and Monomaster. Inside I keep the rods waiting to be used, the Badger Broad Spectrum SPF 35 Sunscreen (I use to be a big Banana Boat guy, but then read how bad things like retinyl palmitate, Oxybenzone, and/or Nanoparticals are), Ben's bug spray, a Coghlan's Snake Bite Kit (not that it would be effective, it just makes me feel better to have), a Niteye EC-R26 flashlight (with custom made bite guard), and the Sawyer Squeeze with gallon bag (being able to leave the bladder at home and drink from the stream changed my life). I keep a bottle of assorted medicinal pills, a lighter, and some light duty firstaid in a pocket, and I stuff a snack in where it will fit. For a landing net, I use a Shimano Folding Damo Keiryi 25. I had been using a TUSA Tamo, but I kept crunching it while sliding over boulders and such. The Shimano stays out of the way, however, it isn't great for faster water or bigger fish. I am looking to add another net to my gear and sub it in on big water days. On my person I hang the Kershaw folder. Not shown are a cheap pair of cheater reading glasses (I prefer 1.5X) and inexpensive polarized sunglasses (anything over $20 I will leave on rock somewhere for some reason). I usually sport a long-sleeved fishing shirt and keep my Lumix DMC-TS25 I-can-bounch-you-off-boulders-into-the-stream camera in one of the breast pockets. In the other pocket, I might bring another box of flies, especially when guiding. 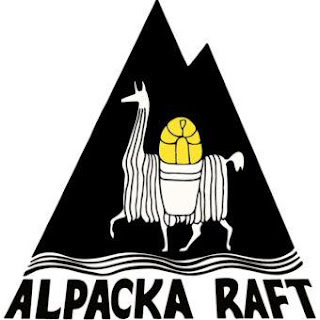 Of course, if fishing a fast and deep creek where I have to get wadered up, I will put on a vest, but it will be mostly empty besides the gear found in the strap pack. Likewise, if I'm going on a longer hike or into wilder places, I will things like a layer of clothes, a Delomre InReach, more first aid,s and/or bear spray to the Camelback.